MIAMI - The Caribbean Hotel and Tourism Association (CHTA) and the Diving and Equipment Marketing Association (DEMA) have agreed to work together to enhance the attractiveness of Caribbean destinations to diving enthusiasts. A Memorandum of Understanding between the two nonprofit organizations commits them to advocating for coral reef protection, more coral nurseries and cleaner seas through the reduction of plastic pollution. 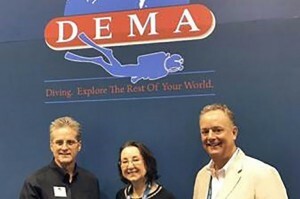 The agreement was signed at DEMA’s trade event for the diving, action water sports and travel industries, which ends in Orlando on Saturday, November 4. The organizations agreed they will collaborate on identifying effective and appropriate means of generating artificial reefs in the region, as well as partnering with organizations working on reef restoration and coral regeneration. Also agreed upon was the need to promote and expand dive tourism in the region, and for both associations to educate their members on dive travel and on the potential benefits of dive tourism for the Caribbean, such as increased employment for local populations. Promoting the Caribbean Sea as a safe and feasible year-round dive destination, plus allaying fears of hurricanes through the provision of factual information, were also listed as priority activities for the newly partnered organizations. The two associations also saw eye to eye on reciprocal membership and shared promotions, agreeing on the inclusion of a DEMA booth at the Caribbean Travel Marketplace event run by CHTA, and, in turn, a booth for CHTA at the next DEMA exposition. Tom Ingram, DEMA’s President and CEO, said as a worldwide trade association for the recreational diving and snorkeling industries, including more than 1,400 member companies worldwide, DEMA was keen to strengthen its relationship with the Caribbean through CHTA. “Building valued relationships is critical for our organizations and we look forward to leveraging benefits for both our memberships through this smart partnership,” he said. Photo: CHTA President Karolin Troubetzkoy (center) confirms the agreement with DEMA CEO Tom Ingram (left) and DEMA Board Chair Tim Webb.